Hard to believe it has been four years since the release of the last Dresden Files book, and sure, fans might have a little longer to wait until Peace Talks, but for now, an anthology would tide me over quite nicely. Peace Talks is a collection of new and old (but mostly old) short fiction that takes place in the world of Harry Dresden, collected in one convenient volume. Together with the previous anthology Side Jobs, these books give you a chance to catch up with all the stories if you haven’t had a chance to do so yet. The opening story is a Western, as evidenced by its title, following Anastasia Luccio long before she has achieved the post of commander of White Council wardens. Riding in pursuit of a rogue warlock named Alexander Page, Luccio heads into Dodge City where she meets Wyatt Earp and teams up with him to take on a couple of necromancers. In his foreword for this story, Jim Butcher writes: “Some stories happen because a writer gets inspired by some wild idea that needs expression. Some stories are carefully put together as part of a greater whole. And some stories you write because a professional friend asks you if you want to contribute to an anthology, and it sounds like a really fun idea.” This third reason given is why I typically don’t tend to read “side stories” that are tacked onto a main series, preferring the “inspired” and “carefully put together” ones instead. Plus, with any series, I always seem to end up forming attachments to only a small number of characters, and as such, I find I have very little interest in novellas or shorts that feature the perspectives of other minor characters or people in the series universe. I’m guessing this is why I didn’t like this story as much as I’d hoped. To be honest, I barely remember Anastasia Luccio from the main series, and while meeting Wyatt Earp was kinda cool and on the whole this was a fun little story, A Fistful of Warlocks still had that “throwaway” vibe to it that makes me doubt it will stick in my mind for very long. I had much better luck with B is for Bigfoot, which is also the first story of what is now known as Butcher’s “Bigfoot trilogy”, a trio of short stories featuring Harry Dresden and his interactions with the Sasquatch known as River Shoulders. In this one, Harry is hired to help Irwin Pounder, River Shoulders’ son who lives with his human mother. It seems lately that Irwin has been having some trouble at school, and Harry takes it upon himself to give the boy a talk about bullies. For such a short tale, this one had a lot of heart, and both River Shoulders and Irwin are great additions to the Dresden universe. Originally included in the manual Dresden Files RPG: Core Rulebook Volume 2 – Our World, this short story shows Harry in a role of teacher to a group of young wardens. I liked how it featured another side of the character, though plot-wise it was a bit undeveloped. Since the tale was first published in an RPG rulebook about the many different factions, people, and creatures of the Dresdenverse, I didn’t really expect a lot from it, but I had hoped that it would be a bit more memorable. We’re back to River Shoulders and Irwin Pounder in this story, and I couldn’t be happier. This time, Irwin is a little older, attending the prestigious Saint Mark’s Academy for the Gifted and Talented. But his supernatural origins might have attracted some unwanted attention, so his mother Dr. Helena Pounder hires Harry to keep an eye on her son. Sure enough, when Irwin gets sick, Harry is not convinced that it’s just a simple case of mono. These Bigfoot stories are becoming the highlight of this anthology, and this one had a funny twist at the end too that had me laughing. I had a great time with this one. Set between Small Favor and Turn Coat, this story begins when a man walks into Harry’s office attempting to hire him to remove the curse that was supposed placed on the Chicago Cubs during the 1945 World Series. It was an interesting premise, but I just didn’t find myself too invested in the story, though I’m sure it would be immensely more fun for baseball fans or Chicago natives. At the very least, I got to learn some new things surrounding what is known as the Billy Goat Curse. Set between Turn Coat and Changes, this story is told from the perspective of one of the series’ most notorious characters, the mob boss known as “Gentleman” John Marcone. Things begin in his office with a visit from Justine, who arrives with a child in tow, claiming that she is being pursued by the Fomor, a race of water-dwelling creatures. Justine wants protection from Marcone, who is about to turn her away until the leader of the Fomor himself crashes his headquarters, changing the situation. 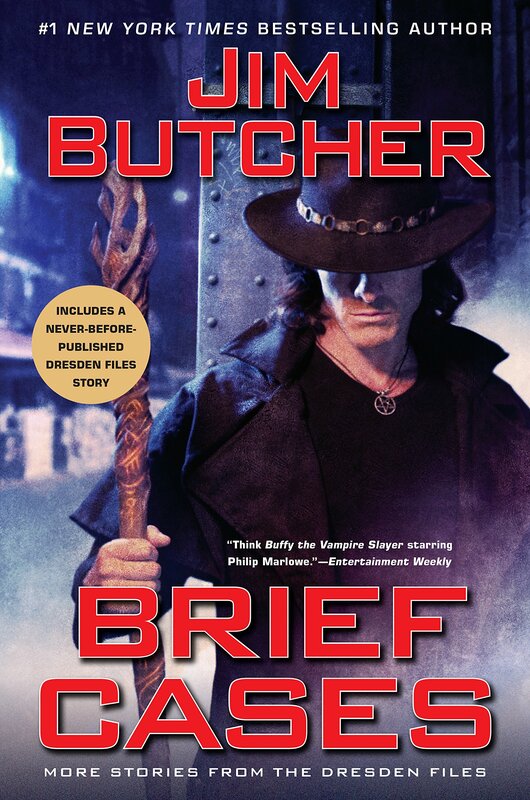 I’ll be honest; I was a never a big fan of John Marcone, even though he’s one of the most prominent characters of the Dresden Files series, having been around since the beginning. That said, I’ve always liked the complexity behind his personality and motivations, and this one did a nice job showing him operating in his own world. And so ends the Bigfoot trilogy with this final River Shoulders story about Harry helping Irwin Pounder for the third time. Irwin is now all grown up and in college, playing on the football team, dating a pretty girl, and generally busy doing college student things. However, when it is discovered that Irwin’s girlfriend Connie Barrowill is a vampire of the White Court, Harry goes to let River Shoulders know that his son may be in danger. But as always, things are never as they seem, especially when it turns out Connie is also unaware of her true nature. Things turn a little dark in this Bigfoot story, but I loved the deeper themes in the end about fatherhood and trusting in your children to make their own way. A story about Molly Carpenter, Bombshells follows Harry’s apprentice showing how she’s been dealing with life since the death of her mentor. This one also begins with the sudden appearance of Justine, who shows up on Molly’s doorstep asking for help looking for her lover Thomas, who is also Harry’s half-brother. For a series I love so much, sometimes it surprises me how few of the key characters actually resonate with me. Molly is another member of the main cast whom I’ve never really felt much for, which might explain why I felt so apathetic about this story. It has only been a few days since I finished reading it, but I’ve forgotten many details from it already. Another Molly story, but I fared a lot better with this one. Cold Case begins with Mab, the Queen of Air and Darkness, charging Molly to collect an overdue tribute owed to the Winter Court. While on her mission, Molly meets up with Carlos Ramirez, a young warden of the Wizard Council, and they strike up a fast friendship and become intimate with each other. Unbeknownst to Molly, however, when she agreed to take on the Winter’s Lady mantle, certain unpleasant “rules” came attached. Admittedly, this story didn’t really wow me until near the end, when the revelations of the mantle’s influence finally hit me like a punch in the gut. I really felt bad for Molly then, and Butcher did such a great job writing her anger, frustration, and loneliness. In this story, Harry is summoned for the direst and most unpleasant of tasks—jury duty. A man named Hamilton Luther is under trial for the murder, and it appears to be a straightforward case until information surfaces about the possible presence of little girl at the crime scene, who would be a key witness—if she could be found. Deciding to take matters into his own hands, Harry follows the girl’s trail and discovers that she has been abducted by a vampire of the White Court. Featuring a mix of action and humor, this was one of the more entertaining and interesting stories of the collection. Yay, a Butters story! I was excited about this one, because here’s a side character from the series that I actually am quite fond of. Day One follows Butters as he embarks on a mission to track down a supernatural predator who has been targeting children, feeding on their nightmares and turning the kids into paranoid and sleepless husks. I have a soft spot for geeks and nerd characters, which is probably why I like Butters so much. Characters like him don’t get much of a chance to shine, so when they get to be the stars of their own stories, however short they are, I take notice. Plus, this one had a hilarious World of Warcraft reference, and because I just happen to be an avid pet collector in that game, huge points for that bit about the murloc egg. Told in three parts, Zoo Day is the only story completely original to this anthology and hasn’t appeared before anywhere else. In it, Harry takes Maggie and Mouse to the zoo, and father are daughter get some quality time to get to know each other. That is, until a fledgling warlock interrupts their plans. These series of events are depicted three times, first from the perspective of Harry, then Maggie, and finally Mouse. This is a story that does many things, but I mainly liked it for showing Harry trying to be a good parent, and Maggie learning what kind of man her dad is. Their nervousness around each other really pulled on my heartstrings, especially with both of scared that they would be a disappointment to the other, when there is in fact no need for worry on that front. It’s immediately clear that the two of them are cut from the same cloth, in that they both have big hearts and want to help others. This was a sweet and touching tale to end the anthology, showing that despite all the troubles in Harry’s busy life, he still strives to make time for his daughter, recalling the loneliness he felt growing up without his parents. Mouse’s POV also succeeded in adding a little levity, because who doesn’t love getting a story from a dog’s perspective? All in all, Brief Cases was a good read. I’m not usually one to pick up short fiction, but I absolutely would not hesitate to make an exception for an anthology like this one, mainly because the stories are in the world of a series I love. While it’s true that most of these fell into the “okay” to “good” category, there were some that were truly excellent, like the Bigfoot trilogy, that made it all worth it. Needless to say, if you’re a fan of the Dresden Files or Jim Butcher, this anthology is not to be missed. You and me both! I’m following both Dresden and that series. I kind of think he’s burned out on Dresden too, though only a few books ago did a “reset” of the character and is turning the series in a different direction. Not sure how that is working out for him. And I love Butcher, but his Codex Alera I just couldn’t get into. I stopped around book three, I think. But as I recall, those weren’t very long. For Cinderspires, if all the books are going to be as tome-like as book 1, I would be happy with a trilogy. I guess you’re right, they WERE pretty long! Man it’s been a while. I’ve read the first three of this series and really loved Harry. I own a few more and honestly it’s just a series that has accidentally got pushed to the wayside. I need to make time for it. This sounds like a good collection and I recognize some of these stories as appearing elsewhere. On a side not, I saw the name Butters and couldn’t help but automatically think of the character from South Park. You can see where my mind is headed this morning. I understand, I have a lot of trouble keeping up with the long running UF series too, especially if I’m already starting from behind. So many have gotten put aside, like Iron Druid, etc. I have never read Butcher so I’m obviously not the target audience for this book. But I’m glad these stories mostly worked for you, I know short stories are a struggle! Yeah, I am not a short story person, lol…but it’s better when I am familiar with the world and characters. I know, I can’t believe it’s been four years since Skin Game, it feels like I read it only last year or the year before. I’m also not caught up on Dresden – I guess I can take my time for now though. I did read a similar style anthology a couple of years ago and I enjoyed it because it gives you little back stories that are interesting when you know the world – otherwise short stories are not for me. Haha, nope you’re not confusing it with another story – Bob the skull is awesome! I also am not the biggest fan of novellas or spin-offs due to them usually ending up being throwaway efforts (like, I wasn’t a fan of the spinoffs for the Kingkiller Chronicles) but I do think the pros of a collection is that you DO find stories that are excellent among the okay ones, so I’m glad you found this engaging and worth your time. 🙂 Very nice reviews! LOL GRRM…it seems like he’s publishing everything BUT the next ASoIaF novel these days. Thanks for the review! I love the series very much, and we are even playing an RPG campaign in the setting, so I guess I’ll have to read the anthology, even though I prefer the full-length novels. Your review tells me that I’ll definitely wait for the paperback edition, though. I’m the same way, give me full length novels over short stories and novellas any day…but when it comes to Jim Butcher I guess I’ll grudgingly read the anthologies 😉 If you’re playing the RPG campaign then you’ll probably appreciate the story AAAA WIZARDRY! Haha, I’m sure I’ll enjoy AAAA Wizardry, then! The Butters story too, by the way, given that I am an avid WoW pet collector myself. Anyway, I don’t know if you’re interested, but if you are, here’s a link to the first few RPG session diaries on my blog.